There are six articles in this issue. The authors are linked to their respective homepages, from which the most up-to-date material on their work will be available. Other links are included, as appropriate. 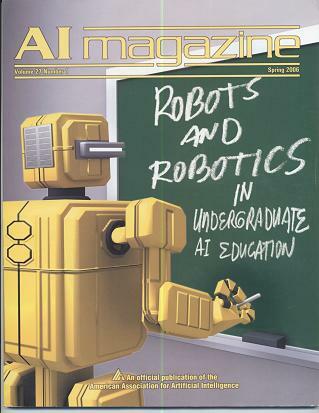 This overview article highlights the many resources presented at the Spring 2004 AAAI Symposium entitled Accessible Hands-on Artificial Intelligence and Robotics Education, whose resources and links are preserved at the bottom of this page. This article offers a novel and thought-provoking framework that unifies a number of AI Robotics ideas that are often considered "competing approaches." Ric has used these ideas to motivate the material and assignments of his undergraduate AI courses. This article highlights the capabilities of the "Python Robotics" (Pyro or Pyrobot) set of software resources. Pyro's homepage is here. Pyro won the National Engineering Education Delivery System (NEEDS) 2005 Premier award for excellence in engineering education courseware. Leveraging the pedagogical scalability of the python programming language, Pyro has been adopted and adapted into dozens of undergraduate courses and research projects. Frank presents the software and curricular resources he has developed to bring Lisp to the Lego Mindstorms' family of robots. These materials form the basis of embodied AI courses within Villanova's curriculum and elsewhere. This article illustrates the variety of ways in which Sony's AIBO robot quadruped has supported undergraduate AI education at Carnegie Mellon University. The course, whose homepage is here uses a set of open-source, freely-available software and curricular modules that other AIBO owners have used as a jumping-off point with the platform. This article demonstrates the considerable extent to which advanced AI topics can be supported by low-cost robotic hardware in the undergraduate AI classroom. The authors describe their successful incorporation of Bayesian Networks, Neural Networks, and Particle Filters on the ubiquitous Handy Board and Lego RCX platforms. This session will continue the demonstrations and poster presentations of the early-morning session. While robot platforms have played a role in artificial intelligence and robotics education for over 30 years, the cost and size of these platforms have limited their reach. Recently, low-cost robot platforms have emerged, extending hands-on educational benefits to a diverse audience. Examples of the flurry of activity in this area include competitions and exhibitions at all levels, the availability of on-line curricula and textbooks, journal special issues, and recent AAAI workshops on Robotics and Education. We believe that these low-cost platforms have matured sufficiently to become a standard tool for teaching artificial intelligence and robotics to advanced undergraduate and beginning graduate students. Furthermore, the accessibility of low-cost platforms introduces the exciting prospect of expanding artificial intelligence and robotics educational opportunities outside the classroom, including non-traditional venues such as museums and do-it-yourself websites. Providing accessible hands-on learning experiences will help inspire the next generation of artificial intelligence and robotics scientists and engineers. Incorporating hands-on exercises into classroom and public venues excites students and provides insights that are difficult to achieve with paper-and-pencil exercises or even simulator programming. Unfortunately, it is extremely time-consuming to build and manage a course that includes hands-on robotics. Existing texts and curricular material stress the use of robots in K-12 education, general engineering, and general computer science. Courses focusing on AI topics, however, tend to push low-cost robotic systems up to -- and sometimes past -- their limits. As a result, the AI community will benefit from (1) an organized set of tested, refined laboratory exercises and (2) the insights of educators who have successfully designed and run such labs. The purpose of this symposium is to disseminate the experience of early adapters by gathering instructional material in a form that can be directly used to build artificial intelligence curricula with hands-on robotics exercises. Our goal is that this symposium results in a collection of material that simplifies the task of designing, creating, and running such courses. These materials may be further extended to engage the public in artificial intelligence and robotics research activities.